This simulation of a gas cloud passing close to the supermassive black hole at the centre of the galaxy shows the situation in mid-2013. Their observations suggest that the space cloud will be completely ripped apart over the next year as it swirls closer to the galactic drain. Scientists first spotted a gas cloud accelerating toward our galaxy's supermassive black hole in 2011. 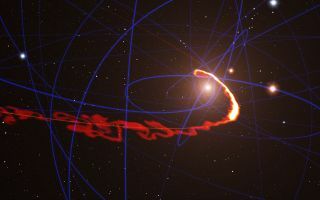 Data from 2004 show that the cloud was once shaped like a circular blob, but the intense gravitational forces of the black hole have now stretched it spaghetti-thin, researchers say. Their new observations were made this past April with the European Southern Observatory's Very Large Telescope (VLT) in Chile. The cloud's light becomes more difficult to spot the more it gets stretched, but a 20-hour exposure with the VLT's special infrared spectrometer, called SINFONI, allowed scientists to measure the cosmic body getting closer to its doom. "Like an unfortunate astronaut in a science fiction film, we see that the cloud is now being stretched so much that it resembles spaghetti," Stefan Gillessen, of the Max Planck Institute for Extraterrestrial Physics in Germany, who led the observing team, said in a statement. "This means that it probably doesn't have a star in it. At the moment we think that the gas probably came from the stars we see orbiting the black hole." At its closest approach, the grossly stretched cloud is a little more than 15 billion miles (25 billion km) from the black hole itself — about five times Neptune's distance from the sun, the researchers say. This is dangerously close considering the black hole's humongous mass, and the cloud, Gillessen says, is "barely escaping falling right in." These observations from ESO's Very Large Telescope, using the SINFONI instrument, show how a gas cloud is being stretched and ripped apart as it passes close to the supermassive black hole at the centre of the galaxy. Gillessen and colleagues say the head of the cloud has already whipped around the black hole and is speeding back in our direction at more than 6.2 million mph (10 million km/h), roughly one percent the speed of light. The tail is following at a slower pace (about 1.6 million mph, or 2.6 million km/h). The new observations will be detailed in the Astrophysical Journal. Scientists plan to intensely monitor the region throughout the year to watch as the cloud gets completely torn apart — a rare opportunity to test theories about how black holes pull in mass. Follow Megan Gannon on Twitterand Google+. Follow us @Spacedotcom, Facebook or Google+. Originally published on SPACE.com.